Miscellaneous Records - Thyberg Family Genealogy by Frederick Bernhart Thyberg. "Miscellaneous Record - Thyberg Family Genealogy by Frederick Bernhart Thyberg." Miscellaneous Record: Thyberg family genealogy by Frederick Bernhart Thyberg. 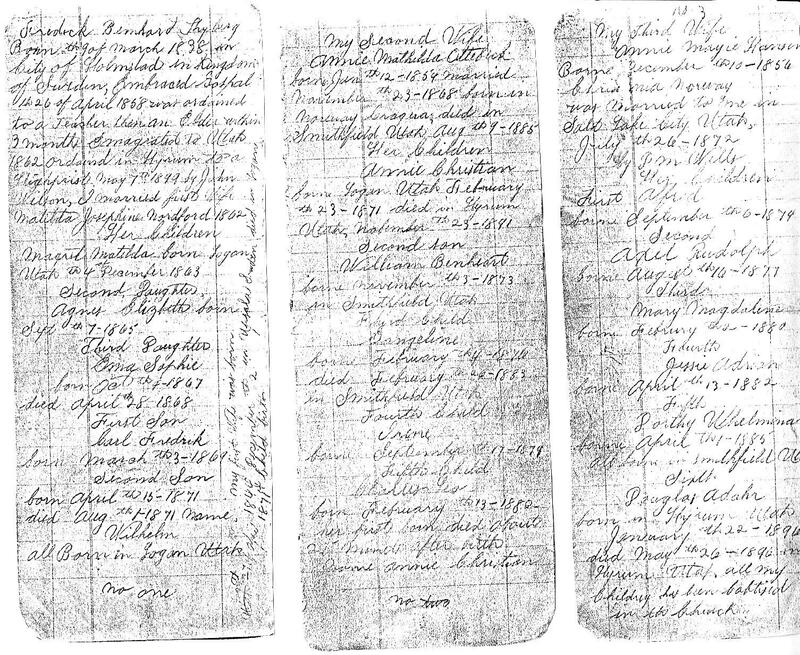 Frederick Bernhart Thyberg wrote the below document containing the Thyberg family genealogy. Fredrick Bernhard Thyberg Born 9th of March 1838 in the city of Halmstad in the Kingdom of Sweden, Embraced Gospal the 26th of April 1858, was ordained to a teacher then an Elder within three months. Emagrated to Utah 1862, ordained in Hyrum to a High priest May 7th 1899 by John Wilson. I married my first wife, Matilda Josephina Nordford 1862. Margret Matilda born Logan Utah the 4th of December 1863. Second Daughter - Agnes Elizbeth born Sept the 7th 1865. Third Daughter - Emma Sophie born Oct 7th 1867, died April 28th 1868. First Son - Carl Fredrick born March the 3rd 1869. Second Son - Born April the 15th 1871, died Aug 1st 1871, named Wilhelm. My first wife was born 1846 December the 2 in Upsala, Sweden, died 1871 child birth in Logan, Utah. Annie Mathilda Ottebeck born June the 12th 1854, married November the 23, 1868, born in Norway, Cragero, died in Smithfield, Utah Aug the 9th, 1885. Annie Marie Hansen born December the 10th 1856 in Christiana, Norway, was married to me in Salt Lake City, Utah July the 26th 1872 by ?Jim Willis? Sixth - Douglas Adahr born in Hyrum Utah January the 22nd 1890. Died May the 26th 1890 in Hyrum, Utah. All of my children have been baptized in the church.